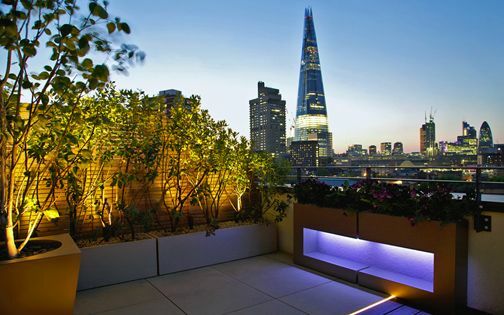 This large roof terrace contained concrete pavers and lawns edged in railway sleepers, yet, with a 360-degree panorama over London, the potential to delineate a modern outdoor space was considerable. 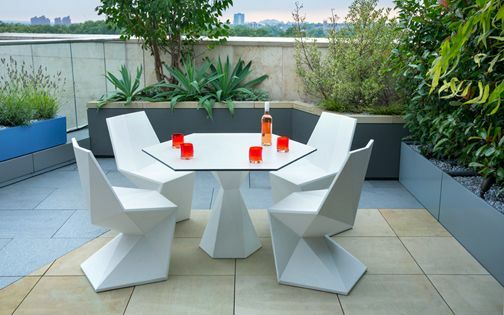 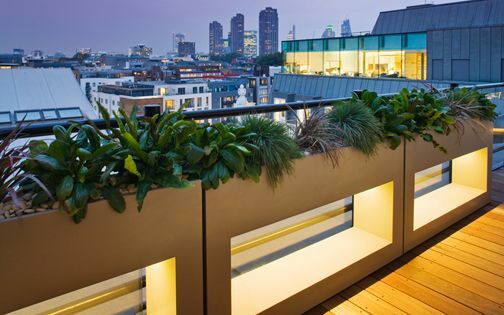 We renewed this Chelsea rooftop terrace into a personal haven, abundant in dynamic detail design, where an expansive, angular hardwood deck echoes red-bricked buildings in the backdrop. 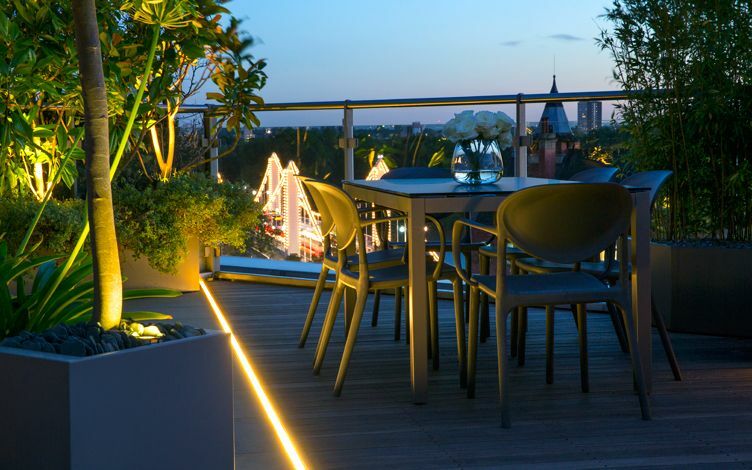 Copious seating hubs and innovative strip lighting reiterate the glory of Chelsea Bridge – defining a state-of-the-art, private roof terrace design framework. 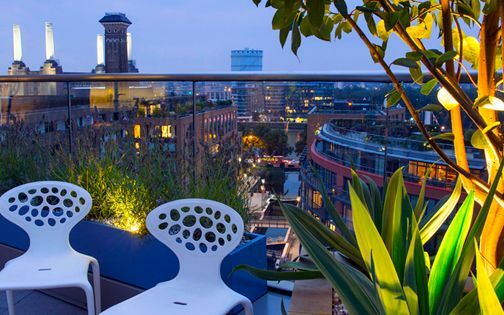 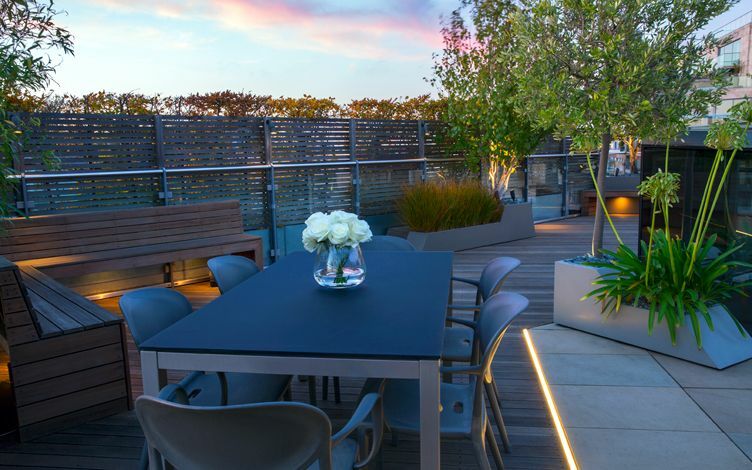 We previously designed and built a series of roof terraces in this Chelsea development, yet, the distinct vistas of its Hepworth Court's largest roof terrace present unparalleled panoramas to an array of iconic London landmarks. 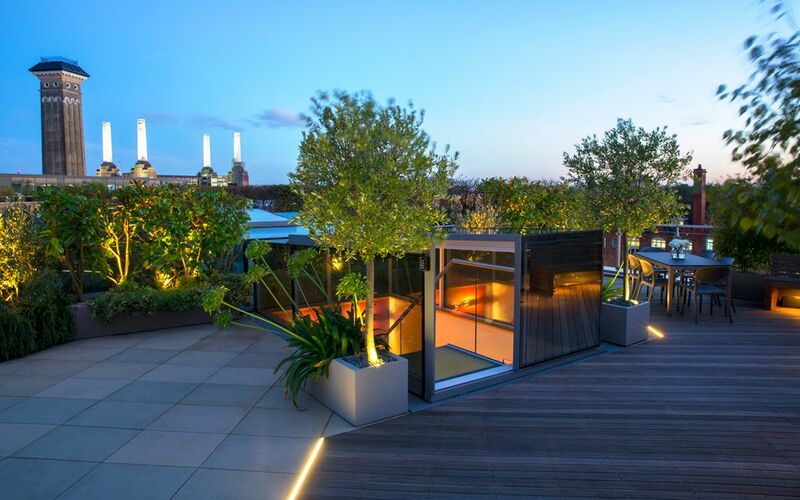 The terrace, however, required an immense clearout to allocate further functional space, and simplify its layout, where incongruous lawns and sleepers were removed to enable laying modern surfaces in facilitating a comprehensive roof terrace redesign. 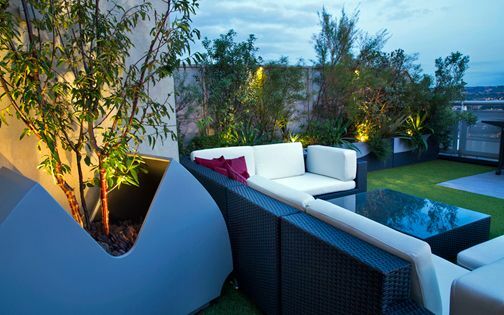 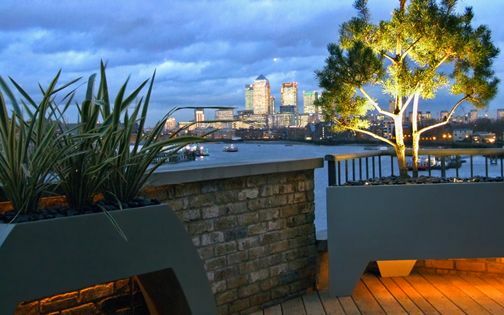 Architectural trees, shrubs and Mediterranean herbs thrive in constant wind, pollution and heat, producing sculptural silhouettes under this spacious roof terrace's urban sky, while redefining scale and intimacy across diverse seating zones to gracefully frame their city backdrop. 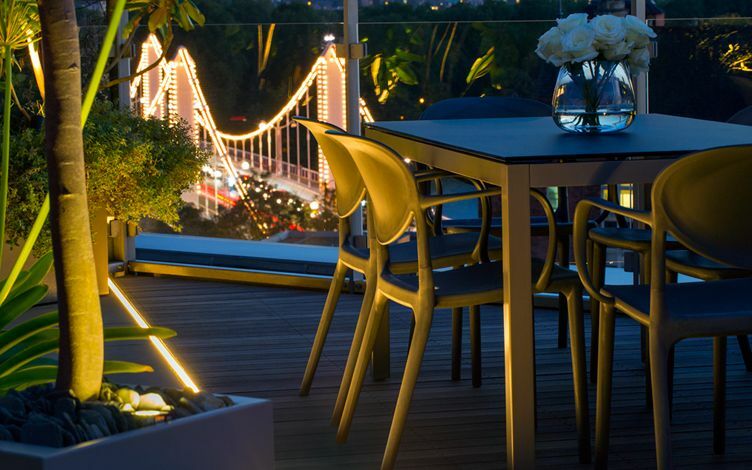 The deck's orientation follows the lines of Chelsea Bridge, while its hardwood and sandstone details are highlighted via LED strip lights, harmonising with the shimmering bridge illumination in an immersive lighting design. 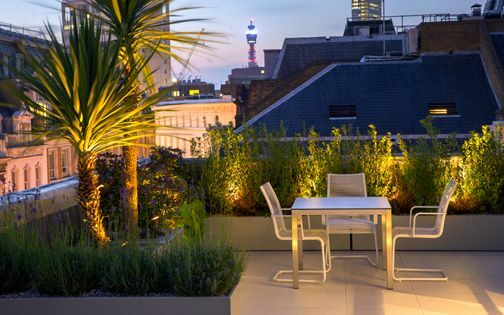 Enveloped by a myriad of adjoining roof terraces, this outdoor space feels truly urban, where leafy, native Hornbeam hedges generate verdant ambience, aptly softening a large-scale roof terrace blueprint. 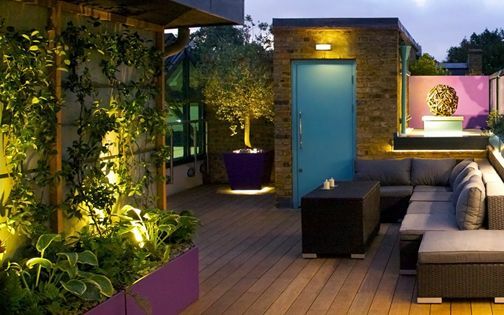 Yet, all the rooftops here endure blustery winds rising over Chelsea Embankment in the west, coupled with a breezy easterly gust. 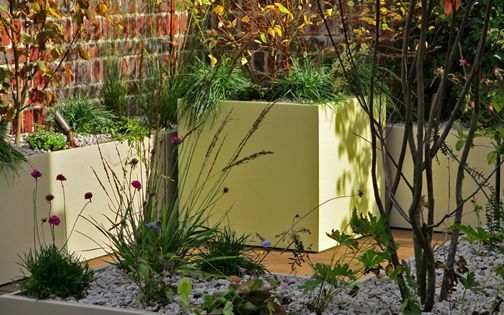 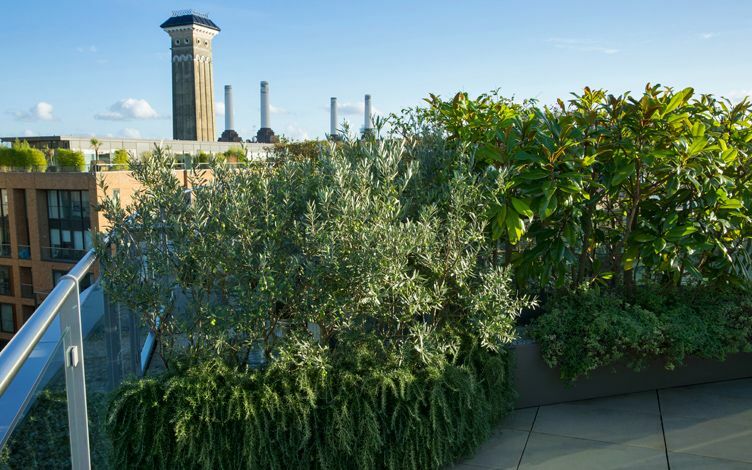 Further shelter was created in corners, where tall shrubs are featured in bespoke capacious planters, forming a roof garden design which infuses human scale and vital refuge within canopied sanctuaries. 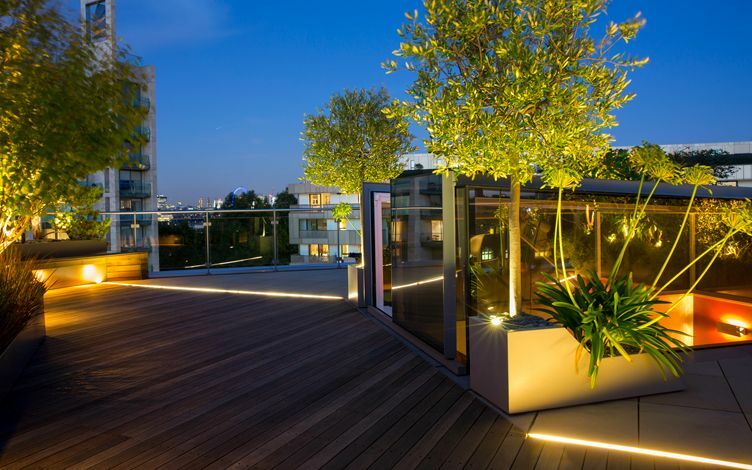 A glass stairway leads up two floors through a cutting-edge interior, before reaching a transparent glazed pod at its top. 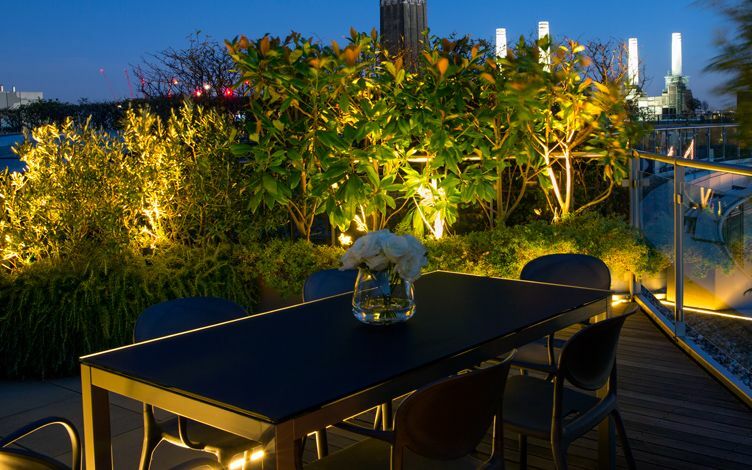 It was essential to articulate modern detail design to complement and highlight the apartment's streamlined decor across its roof terrace. 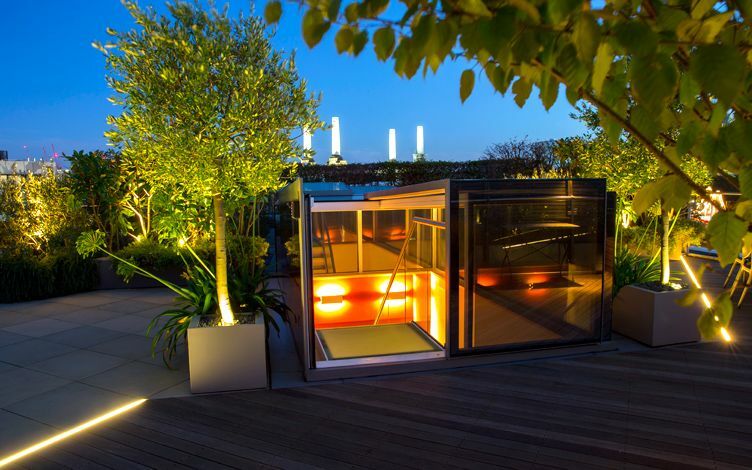 The east vista captures Big Ben centred perfectly within London Eye, where a multi-stemmed Himalayan silver birch frames this view delicately, situated in front of the modern glass pod to form a sculptural entrance focal point. 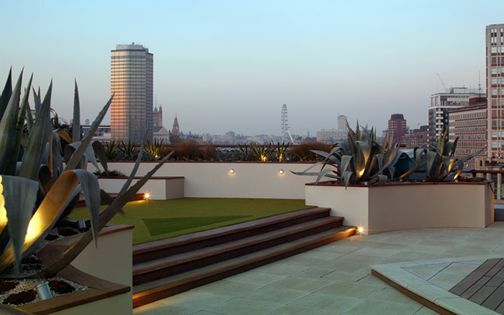 By continually developing these signature roof terrace design layouts, an augmented indoor-outdoor fluidity is layered amid rooftop elevations, producing pivotal compositional elements in our modern penthouse roof garden settings, which enduringly distinguish urban homes and their owners under a dynamic skyline environment. 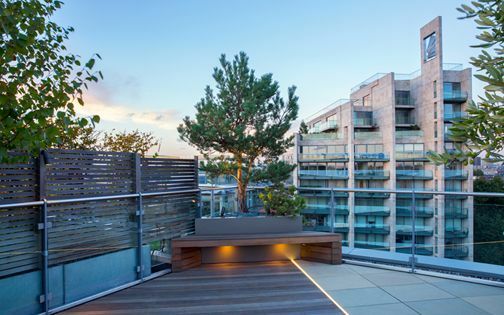 A diagonal deck interconnects with nearby architecture in linear outlines and tonal spectrum, linking to its opulent, cosmopolitan backdrop. 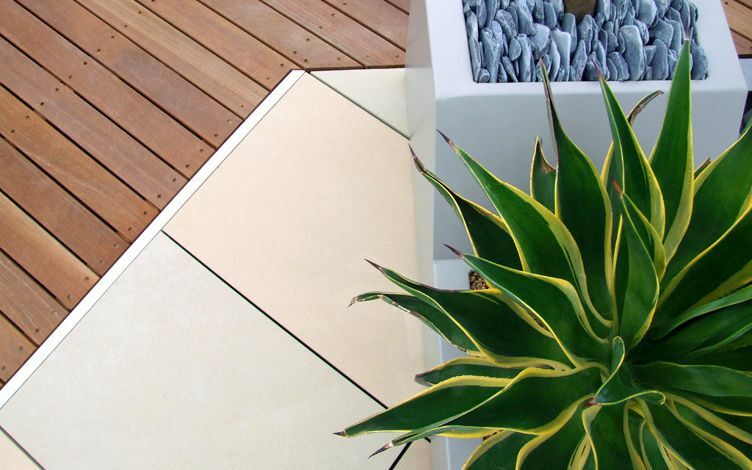 The sandstone was quarried at 700 x 500mm to increase sense of depth, and presents an anthology of warm tones, ranging from buff through yellow to light blue. 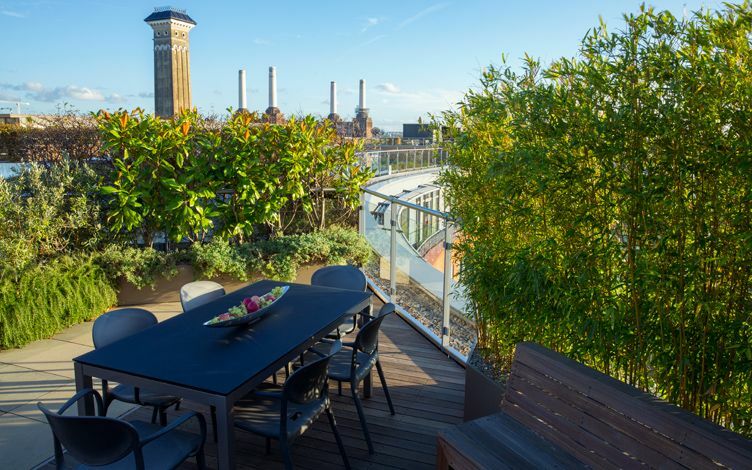 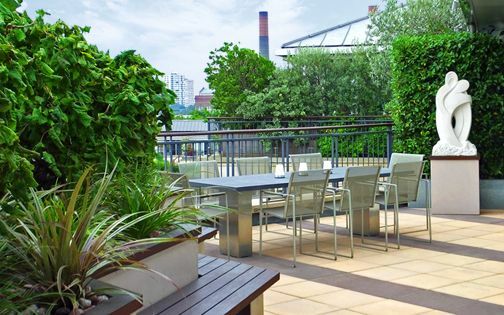 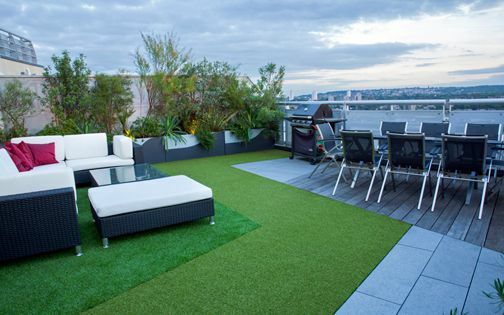 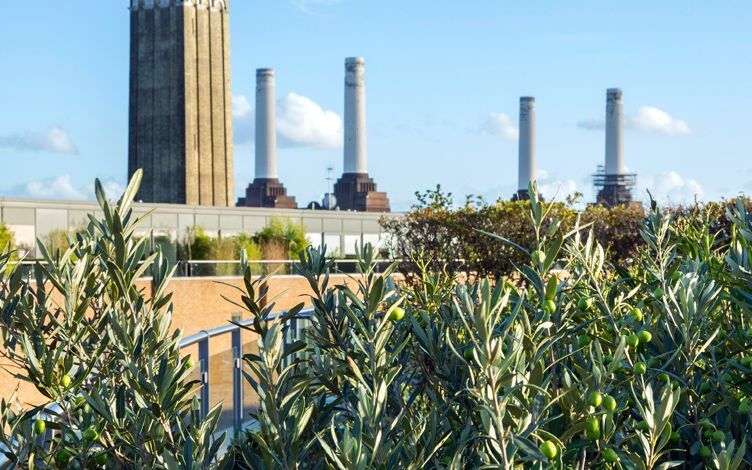 A selection of multicoloured evergreen grasses unifies the hardscape surfaces into a cohesive roof terrace, adding tactility beside seating areas to invigorate panoramic views towards Battersea Power Station, Big Ben, Chelsea Bridge and London Eye. 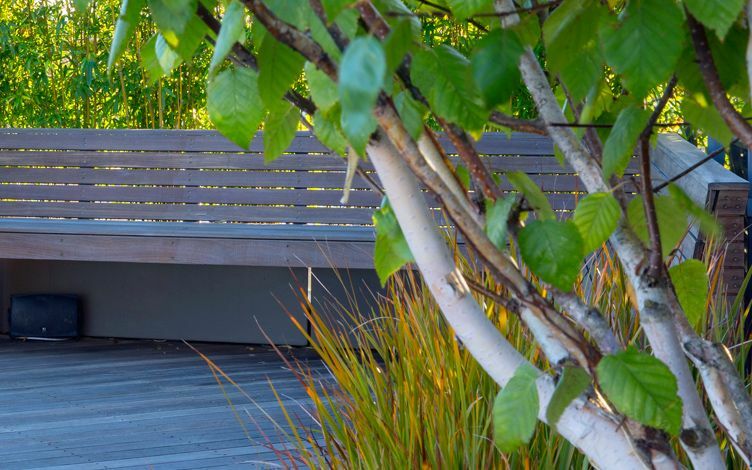 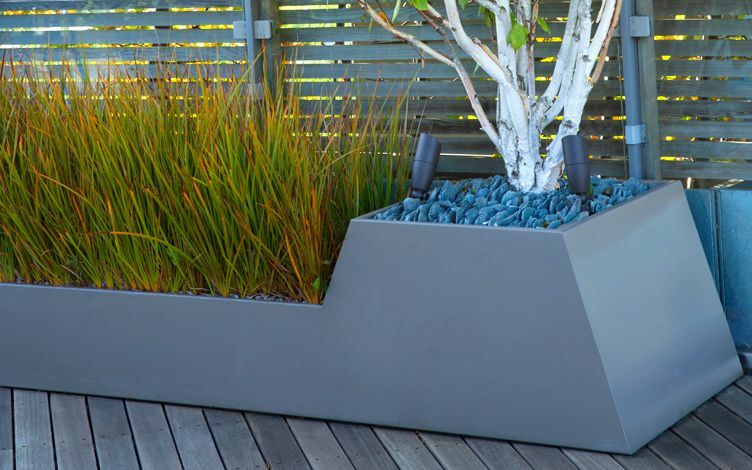 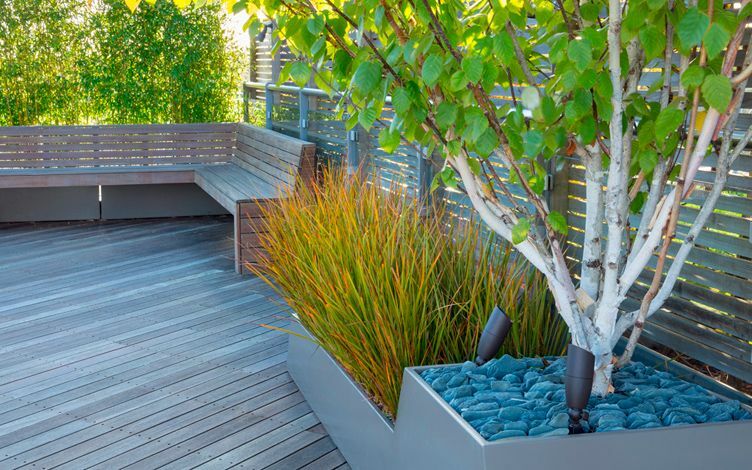 Birch, Olive, Pine and Southern magnolia trees, alongside Agave succulents and tall Agapanthus provide architectural, wind and sun-tolerant focal points – sustaining a low maintenance rooftop.